I have never been athletic so learning that writing fiction, something I love to do, could have the same effect as playing a sport on my brain was intriguing. Apparently, skilled authors working on a plot twist are using the same broad regions of their brain as people performing complex activities like sports or music. This does not come as a surprise to me after working on my books. I know how mentally and physically exhausting and rejuvenating a solid writing session can be! 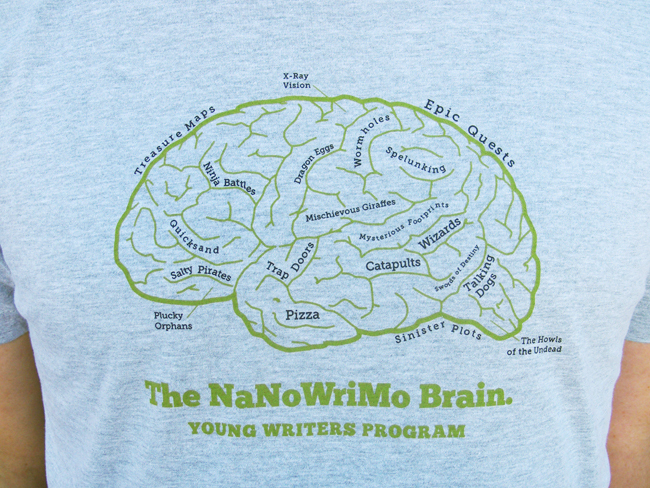 One of my favorite NaNoWriMo tees! I have it on a poster. Neuroscientists have discovered that certain regions of the brain will light up when a person is creating a story because they are most likely visualizing the scene. Other areas light up as an author retrieves information to use in the story. Still other areas light up when a writer is juggling several plotlines and characters. Novice writers tended to activate the visual centers during brainstorming while seasoned authors tended to activate the speech centers. Seasoned authors also activated the caudate nucleus. This is the area that coordinates brain activity when complex tasks become automatic. For example, when you are first learning a new skill you have to give it your full concentration, but after you do it a few hundred times, the coordination and thought process can become rote. That is when the caudate nucleus kicks in. What the heck am I talking about and why am I so excited by this piece of information? Another article on Daily Infographic explained that writing and storytelling can have other wonderous results for the brain. Studies at Princeton University showed that when a person tells a story, the listeners brain activity goes into sync with the storyteller’s brain. This has to do with a stories ability to plant emotions, thoughts and ideas in the listener’s brain. Perhaps the best news yet is that writing can have side effects similar to those of meditation. The brain slows and you are in the zone. Journalers have long known that stream of consciousness writing is a great way to de-stress! I learned first hand in NaNoWriMo that allowing myself to drop into the story and just let the words flow was a wonderful way to forget the day. 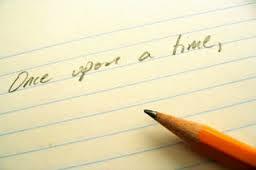 How does writing help you? Do you think of it as a meditation or a wild game?